Located on Pandora, in between Blanshard and Douglas, Nubo is a quaint and somewhat modern Japanese restaurant. I will mention that I have only been here once before this experience, almost a year ago. The restaurant has a “tapas-style” approach, offering a lot of variety of smaller dishes for tasting and sharing. I wanted to try quite a few things although I think my eyes had more hunger than my stomach. Maguro trio: a trio of albacore tuna in three preparations, tataki, chili paste and poke. I thought all three were delicious. I liked the sesame oil in the poke and the chili paste was an interesting taste, not too strong. I could have used some more acidity with the tataki. Overall I think for the price, it was a pretty generous portion. Sashimi bowl: The presentation was appealing. It included octopus, tuna, wild salmon, farmed salmon, sweet egg, cooked prawn and a type of white fish (I forget). It was a large bowl of rice with daikon and sashimi piled on top. The tako(octopus) was slightly fishy tasting. I would have liked the option to just have wild salmon instead of the farmed. Yam roll: I like yam rolls as a break and this roll was packed with it! I would have liked if there was some avocado or cucumber to give a contrast in texture and flavour though. 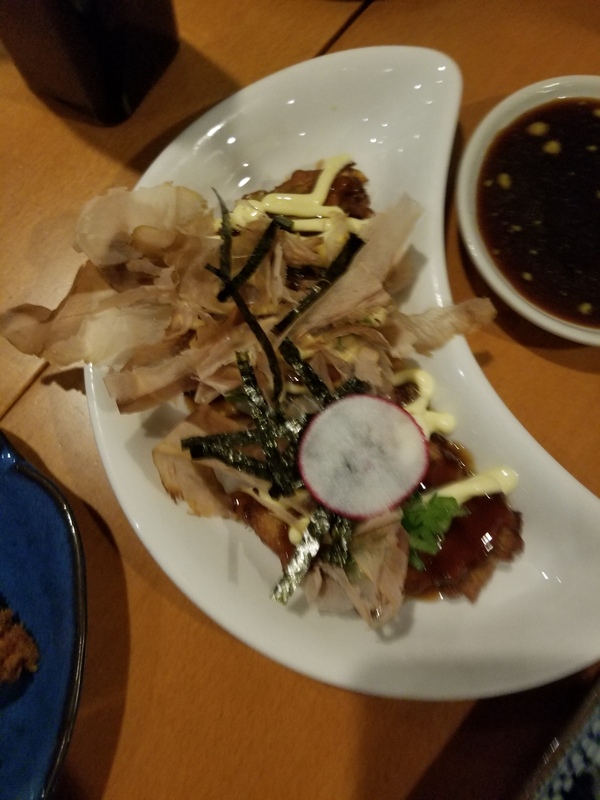 Unagi: The BBQ eel was flawless. Great flavour, melted in my mouth. Served at the right temperature. Loved it. Croquettes: Potatoes and corn in panko with lemon. Potatoes were a bit watery but it was satisfying to eat. Crispy fried mashed potatoes, kind of hard to not like it. Okonomiyaki: This was a fun little appy to share. It’s a Japanese pancake batter with cabbage, usually nagaimo (sticky yam) and this one had shrimp in it. It’s topped off with Kewpie mayonnaise, some bonito flakes and nori. Lots of textures and tastes, creamy, crispy, funky. I enjoyed it. It was a nice night out on a Friday. Nubo also has a decent selection of sake if that’s your thing. I would go back for some of their hot dishes and for a drink. Thanks!